Mount Kinabalu is a prominent mountain on the island of Borneo in Southeast Asia. It is well climbed by people around the world, including Singaporeans. The highest point on Mount Kinabalu is called Low’s Peak; it lies on the Crocker Range and is the highest mountain in the Malay Achipelago. Mount Kinabalu never fails to awe me. I had first climbed it in 1996, and thereafter, I returned to the mountain several times. In 2009, I participated in the Mount Kinabalu Climbathon, and a month after I spent one week on the same mountain to explore the beautiful peaks, engaged in rock climbing and Via Ferrata. It was a rejuvenating experience. What draws me to return to Mount Kinabalu again and again? It is the scenic views, the fresh air, the elevation, the people, and the idea of getting away from hustling and bustling city life. It is that simple. I spent a few days on Via Ferrata and I really enjoyed it. It was thrilling, and I must admit, it was scary at first. Frankly, if anything is too easy, you won’t be challenged to do it. So what is Via Ferrata? A Via Ferrata (Italian for “iron road”) is a protected climbing route found in the Alps and certain other locations. The origins of Via Ferrata date back to the nineteenth century, but Via Ferratas are strongly associated with the First World War, when several were built in the Dolomite mountain region of Italy to aid the movement of troops. However, many more have been developed in recent years, as their popularity has grown and the tourism benefits have become recognised. The essence of a modern Via Ferrata is a steel cable which runs along the route and is periodically (every 3 to 10 metres) fixed to the rock. Using a Via Ferrata kit, climbers can secure themselves to the cable, limiting any fall. The cable can also be used as aid to climbing, and additional climbing aids, such as iron rungs (stemples), pegs, carved steps and even ladders and bridges are often provided. Thus via ferrata allow otherwise dangerous routes to be undertaken without the risks associated with unprotected scrambling and climbing or need for climbing equipment (e.g. ropes). Via Ferrata enable the relatively inexperienced a means of enjoying the dramatic positions and accessing difficult peaks normally the preserve of the serious mountaineer; although, as there is a need for some equipment, a good head for heights and basic technique, Via Ferrata can be seen as a distinct step up from ordinary mountain walking. Conversely, the modest equipment requirements, ability to do them solo, and potential to cover a lot of ground, mean that Via Ferrata can also appeal to more experienced climbers. Via Ferrata can vary in length from short routes taking less than an hour, to long, demanding alpine routes covering significant distance and altitude (1,000 metres or more of ascent), and taking eight or more hours to complete. You don’t have to go to Italy to experience Via Ferrata. The nearest to Singapore, and will not cost you a bomb, is on Mount Kinabalu in Sabah, Malaysia. 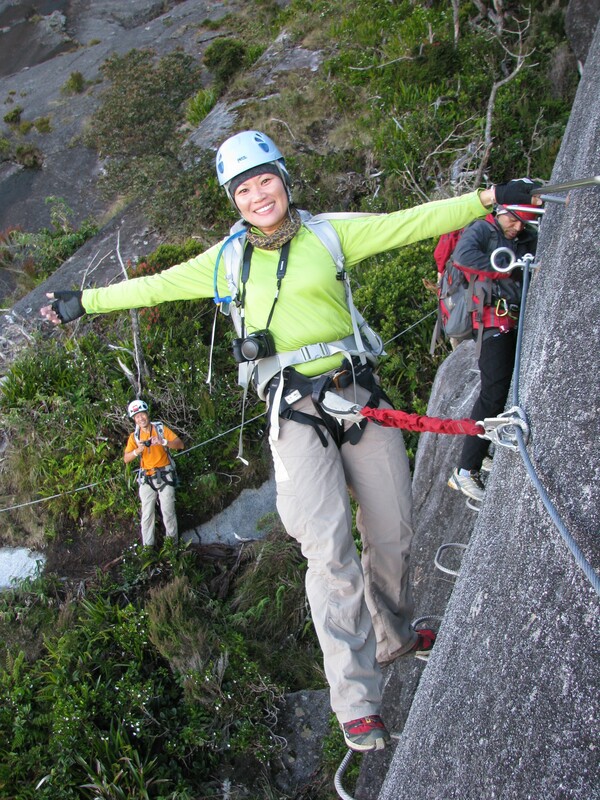 Mount Kinabalu has the world’s highest Via Ferrata at 3,800m above sea level. You trek to the summit of Borneo’s highest peak – Low’s Peak and descent using Via Ferrata; you get the combination of trekking on the traditional route up to the peak and enjoy scenic view from the Crocker Range on Via Ferrata. There are 2 types of routes on Via Ferrata that you can choose from. This is a shorter and simpler version of the Via Ferrata and can be completed leisurely within 2-3 hours. Length of route is only 430m. You’ll get to try out a few obstacles such as the 2 cable Monkey bridge & Balancing beam. This is the more challenging and tougher route. The distance is about 1.2km, almost 3 times longer than the “Walk the Torque” route. You’ll need an estimated 4-6 hours to complete this. The low peak circuit will eventually connect to the walk the torque and hence you won’t miss out on anything. You don’t have to be a super human to climb a mountain, not to mention to experience Via Ferrata. There will be a practical training session before you make an attempt on the Via Ferrata. From training to the actual attempt, the entire process will be conducted and supervised by Mountain Torq Ferrata Trainers. Having scaled a couple of 8000m peaks and a climbing instructor myself, I am impressed with the Trainers’ dedication to safety and the welfare of the trekkers. Because the safety aspect was already taken care of, I could focus on creating my own new experiences on Mt Kinabalu. Rinjani’s towering volcanic presence dominates the entire Indonesian island of Lombok. Within its huge crater, surrounded by a complex of jagged peaks and smoking fissures, lies a stunning emerald-green caldera lake said by locals to be the home of the goddess Anjani. The strenuous climb to the summit culminates in a breathtaking view that takes in the tropical idylls of Bali and Sumbawa as well as the winding coast and green valleys of Lombok. Gunung Datuk is located near the town Rembau in Negeri Sembilan. At 885m above sea level, it is the highest peak in Negeri Sembilan. It is a popular mountain for day tripper, the trail up is not too difficult and a round trip to the rocky summit and back would take about 4 to 5hrs. It has an interesting summit made of huge rocks, with some metal ladders put up to enable climbers to get to the very top. For those afraid of height, the last portion would seem to be very challenging. The awesome view of the surroundings will make the effort well worth it. Mount Kinabalu, standing tall at 4095m is not only the centerpiece of Kinabalu National Park – a UNESCO World Heritage site – but undisputable the most prominent mountain on the island of Borneo in Southeast Asia. AoTaiJi (奥太基 / 5300m), AoTaiMei (奥太美) / 5200m) and AoTaiNa (奥太娜 / 4800m) make up the SanAo mountain range (三奥雪山) on the eastern foot of the Tibetan Plateau in the Aba Tibetan Autonomous Region, Sichuan, China. Of the 3 peaks, only AoTaiNa (奥太娜 / 4800m) can be climbed. The terrain to the peak of AoTaiJi (奥太基 / 5300m) and AoTaiMei (奥太美) are too steep and dangerous. It is possible to climb AoTaiNa (奥太娜) all seasons with each season showcasing different sides of the mountain. In spring, Rhododendron (杜鹃花) blooms in abundance while in autumn, the mountain range burst into fiery colours of yellow, red, orange and brown and, in winter, it is transformed into a winter wonderland. Of the four seasons, AoTaiNa’s (奥太娜) peak is almost snow-free only in summer. This expedition hopes to expand the story about ordinary people achieving extraordinary results by tracing the footsteps of the Everest climbers to the Base Camp. Everest Base Camp trek is one of the best adventure trekking destinations in Nepal. The experience on the trek is everything an adventure traveler could ask for. The breath taking views of the snow-capped mountain ranges are simply undeniably attractive, and the experience of the daily routine of high altitude living offers individual an opportunity to discover the inner strength hidden within. Island Peak, also known as Imja Tse, is one of the most popular climbing peaks in the Everest region. It not only attracts trekkers who want to upgrade their climbing credentials from trekking to climbing a snow peak, Island Peak is also climbed by many experience mountaineers as acclimatization for higher peaks like Ama Dablam and even Mount Everest. Standing at 6189m above sea level, Island Peak is a stand-alone-peak among the surrounding majestic peaks. This mountain was named “Island Peak” in 1952 by a climbing team of Eric Shipton due to its striking location in the middle of the Chhukung valley, like an Island on a sea of ice. The island of Taiwan has more than 100 mountains exceeding 3000m with the highest being Yushan (3952m) and 2nd highest being Xueshan (3886m). Both peaks are part of the famous “Top 100 Peaks of Taiwan” (台灣百岳). Yushan is also known to be the fourth highest mountain on an island and highest point on the Tropic of Cancer. Yushan is sometimes climbed together with Mt. Kinabalu in Malaysia and Mt. Fuji in Japan by trekkers to collect the special “Asian Trilogy” experience. As with almost all the mountain ranges in Taiwan, both mountains are located in central Taiwan with Yushan in The Yushan National Park in Xinyi, Nantou Country and Xueshan in Sheipa National Park in Dahu Township, Miaoli County. The ice climbing course is aimed at those with little or no winter walking experience who would like some training in winter mountaineering skills perhaps with a view to moving onto steeper ground. You will learn to climb on vertical ice fall with the focus on developing good footwork, rope skills, and proper handling of ice equipment. Some important techniques and practices common in rock climbing that are employed in ice climbing include knowledge of rope systems, tying in, belaying, and lowering. Beginners should learn these techniques before attempting to ice climb. Course will be conducted by Mr Lim Kim Boon, qualified mountain guide certified by Chinese Mountaineering Association (CMA) & certified Climbing Instructor Assessor with Singapore Mountaineering Federation (SMF), and the climbing coach and team manager of the Singapore Women’s Everest Team.